NOTICE: Smart Grid operations are no longer authorized. 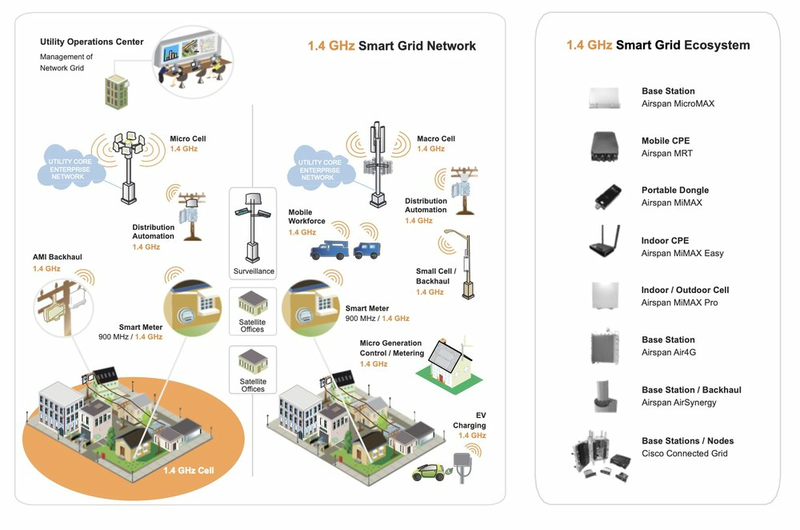 Prior to determination that 1.4 GHz Smart Grid network operations represented a significant hazard to life-critical Wireless Medical Telemetry Service (WMTS) networks, initial facilities and a significant ecosystem of 1.4 GHz Smart Grid infrastructure were constructed for use by electrical utilities. Following termination of lease activity and the revocation of all commercial 1.4 GHz licenses by the FCC, operation of 1.4 GHz network facilities and discrete hardware is no longer authorized. Due to the large surplus of 1.4 GHz commercial equipment that resulted from suspension of network buildout, TerreStar Medical is aware of an active secondary marketplace for unauthorized Smart Grid equipment. Electrical utilities and vendors are advised that operation of this equipment is unlawful and hazardous to medical operations at approximately 8,500 hospital deployments across the United States. Existing facilities and all equipment certified for the commercial 1.4 GHz band must remain inactive. Equipment developed and certified for 1.4 GHz commercial services was designed to operate as part of an integrated Smart Grid network. While early integrated facilities were deployed in select license areas, unauthorized use of commercial equipment for ad hoc networking applications is the primary concern. Several 1.4 GHz transceiver classes were certified and may be positively identified by their FCC IDs. Transmitter certifications for equipment deployed in 1.4 GHz Smart Grid applications span six separate FCC IDs and were integrated into several infrastructure and device models produced by Airspan and Cisco. Get Assistance: For assistance identifying and deactivating unauthorized 1.4 GHz Smart Grid equipment, please contact TerreStar Medical. IMPORTANT NOTICE: 1.4 GHz Smart Grid operations are no longer authorized. Copyright 2014-2019 by TerreStar Corporation. All rights reserved.